This month on A4NH’s Gender-Nutrition Idea Exchange, we welcome commentary from our research partners at Leveraging Agriculture for Nutrition in South Asia (LANSA) on the benefits, challenges, and trade-offs for improving nutrition outcomes through women’s empowerment in agriculture. The LANSA consortium, of which A4NH is a member, is a multi-partner research effort led by M S Swaminathan Research Foundation in India. The focus of LANSA is to understand the role of agricultural policies and practices in improving nutrition in Afghanistan, Bangladesh, India and Pakistan. Gender is a key crosscutting theme across all research and is a critical factor considering links between agriculture and nutrition. This post relates to an upcoming e-discussion, led by LANSA, on the FAO’s Global Forum on Food Security and Nutrition (FSN Forum) to be held between June 27 and July 15, 2016. Inputs to the e-discussion are welcome on processes or examples of good practice with regard to policy changes empowering women in agriculture, and how these changes altered the woman’s nutrition status for the better, and subsequently child nutrition. South Asia has had extraordinary economic growth over the last two decades, yet has the highest rate of child malnutrition in the world, with 4 in 10 children chronically malnourished. 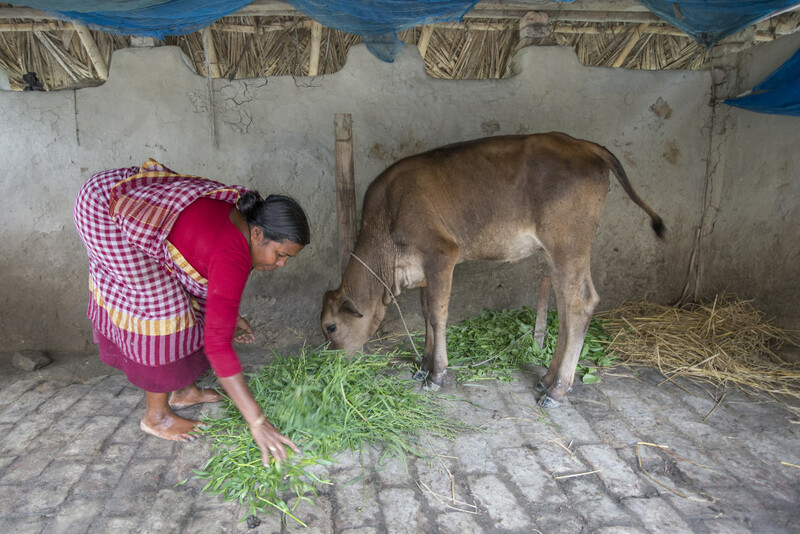 While agriculture (including livestock and foraging from common property resources) is the main livelihood for a majority of rural families in the region, its potential to address undernutrition is not being realized. We see this in macro-level neglect of rural areas in targeted agriculture and infrastructure investments, in adverse prices for agricultural commodities, and also in the neglect of potential skills and returns in the increasingly feminized agricultural workforce. Even though most nutrition interventions target women, given their central role in childcare, the problem still persists. So, what is really missing in our research and analysis, and in our policies? We are missing a socially differentiated analysis of women’s position, roles, and work burdens, the disadvantages they confront due to the intersections of caste/ethnicity and gender across contexts and life-cycle, that may enable or limit their opportunities to make decisions. Men too are missing from policy discourses on nutrition, though food production and provisioning are central to masculinities in South Asia. These gaps in our understanding must be filled in order to inform policies and programs in the region. LANSA’s research program seeks to do this. Women’s time is limited, and recent research has indicated that the regularity of feeding and care, which is seen primarily as a woman’s job, has significant implications for the nutrition and health of children below two years of age (Kadiyala et al 2012). In South Asia, women are responsible for ‘reproductive’ activities (childcare, domestic work, health care) in addition to both paid and subsistence ‘productive’ work. Yet these social norms and expectations are not fixed, they shift through an individual’s life-course, but also in response to broader social and structural changes. New production regimes, processes of commodification, migration, price fluctuations, market competition, educational expansion, health provision, and contexts of conflict, can all change the dynamics of gender relations, and consequently, nutritional outcomes (Mitra and Rao, 2016). These changes all contribute to shaping gender hierarchies and hence deserve due consideration. In Afghanistan, the Ministry of Agriculture, Irrigation and Livestock (MAIL), supported by FAO, has formulated a strategy on women in agricutlure for 2015-2020. It argues that the role of women in the Afghan agricultural sector is a paradox: 1) on the one hand, women are major actors in agriculture contributing more than 40% of the labor force; 2) at the same time, Afghan women are marginalized in relation to control and decisions over productive resources. This highlights the potential for change. The message is clear: ‘empowerment of women is fundamental to reduce poverty, hunger, and improve food security’. Child undernutrition is alarming in Bangladesh with 36% stunting, 14% wasting, and 33% underweight. This is an agrarian country with about two thirds of the population engaged in agriculture (almost half are women), hence with huge potential to improve nutrition via agriculture. While nutrition and agriculture experts stress the importance of women’s involvement in agriculture to improve their own nutritional status as well as their child’s, there is only limited evidence on how this may be done. The case for India is similar, where a majority of rural women are engaged in agricultural work. Peak planting and harvesting seasons reduce time allocated for ‘care’ work. Amidst competing demands for time and labor, women face a harsh trade-off: to work (either on their own farms or for a wage) or to care for their children. While there are policies for women’s empowerment, for supporting women in agriculture, and for improving nutrition, there is little synergy between them. LANSA’s research in India demonstrates that nutritional and wellbeing outcomes are unlikely to improve substantially without attention to reducing drudgery or redistributing women’s work (within households, communities, and with state institutions), or without attention to socio-economic positionality. Emerging findings from LANSA’s research in Pakistan show that women's agricultural work can have positive impacts (through higher incomes) as well as negative impacts (through less time and physical energy available for their own and their children's care) on nutrition. The agricultural workforce is becoming increasingly feminized and evidence shows that children of female agricultural workers suffer from higher levels of undernutrition. However, women’s agricultural work remains almost universally underpaid (or unpaid in many contexts) and places a high burden on women's time and in some cases their health. In addition to care practices, certain agricultural activities, such as cotton picking and livestock rearing, are deemed exclusively as ‘women’s work’ and men fail to compensate for increases in women's agricultural labor by providing more care in the household. Although some progress has been witnessed in Pakistan with the formulation of the Inter-sectoral Nutrition Strategy, women's work still needs greater recognition in agricultural policy, programming, and investments. There is also scope for altering policy and program designs in health and nutrition, labor, social protection and women's development sectors to take account of this linkage. All of these findings point to the necessity of having continuing discussions among members of our gender-nutrition community about which policies, programs, and approaches work best to enable women in South Asia to manage their competing responsibilities and improve household wellbeing and nutrition. One of the ways LANSA is facilitating this process is by partnering with FAO’s Global Forum on Food Security and Nutrition (FSN Forum), which is hosting an online discussion from June 27 to July 15, 2016. How far can policy recognition of women’s roles and contributions to agriculture lead tostrengthening women’s agency, empowerment and in turn nutritional outcomes? Do men, community / state institutions take responsibility for the care of young children, especially during peak cultivation seasons when women’s labor is much needed? Are you aware of changes in gender divisions of work, roles / responsibilities in contexts of change (e.g. : shifts in cropping patterns, technical innovations, the loss of ecosystem services, social and political conflict)? How is the contribution of men to household nutrition changing? For Afghanistan, we want to capture experiences about women’s roles in agriculture and agribusiness value chains in order to shape policies and interventions to recognize and support women’s contribution to livelihood security. Kadiyala, S., Harris, J., Headey, D., Yosef, S., & Gillespie, S. (2014). Agriculture and nutrition in India: mapping evidence to pathways. Annals of the New York Academy of Sciences, 1331(1), 43-56.